is your piano insect damaged? have you had your piano checked over? do you live near a woodland, lake, stream, river or canal? do you know the classic signs of insect invasion? HAVE YOU JUST BOUGHT A PIANO "BLIND" ? 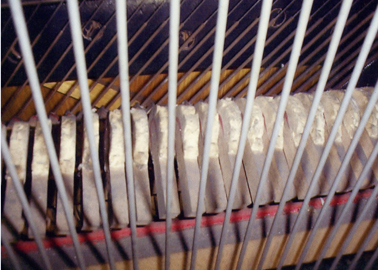 This report contains detailed images and information about piano insect damage. If you are in a nervous disposition, DO NOT read this report. If you are thinking about buying an old piano, always have it checked over first by a qualified piano tuner / technician.... this may save you a lot of money in the long run. A piano tuner will charge you a call-out fee for inspecting a piano of your choice. 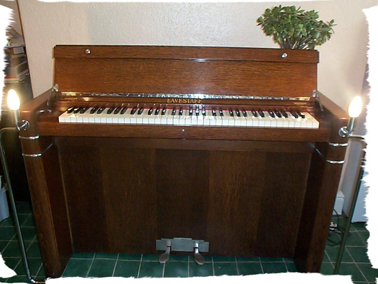 If you buy an old piano "blind" i.e. not looked at, not played, not looked inside, then you may as well buy this piano above - you stand more of a chance buying an old piano in a cold garden without insect damage, rather than one in a lovely warm cottage near woodland, rivers or canals. If you are buying any kind of piano, newish or old, and if you know the approximate location of the piano, always check the map for woodlands, streams, rivers and canals. Insects tend to breed more in these locations and lay their eggs, due to damp undergrowth, trees and stagnant water. 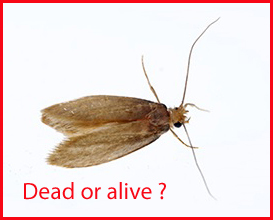 Depending on the climate, the most common insects to breed are the moth, may fly and occasionally butterflies. If the climate is warm or hot, mosquitos are common, but rare in the UK. WHAT'S THIS TO DO WITH PIANOS? 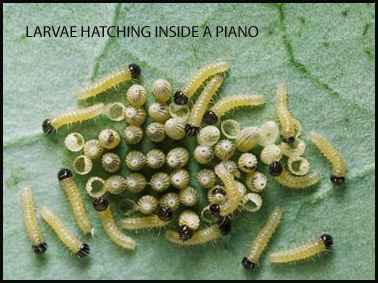 OK.... if an insect finds a warm and dark environment, with plenty of food for their baby maggots, the piano is the perfect location. 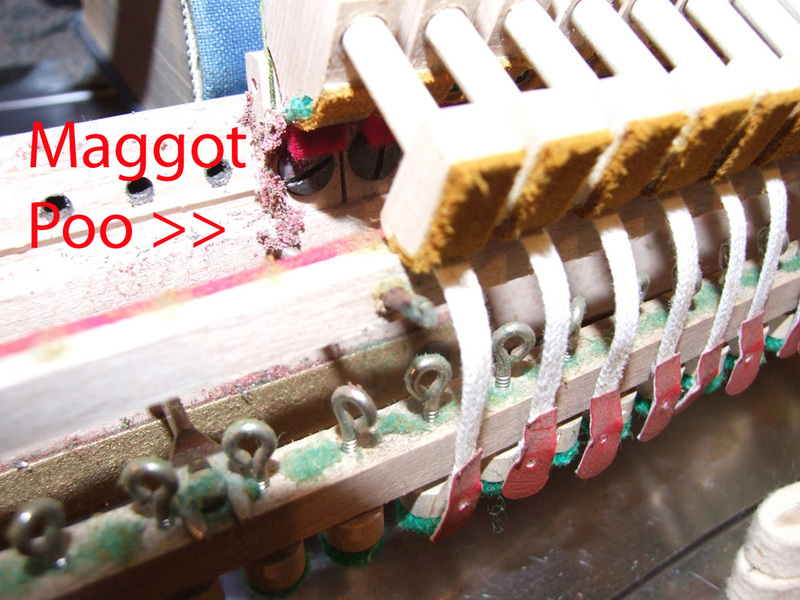 A piano mechanism (and most of the inside bits) are made up of various cushion felts, cloths, baizes and other luscious materials for maggots to get their teeth into.... and once the eggs have hatched, the larvae will love it. They tend to feed on flat horizontal surfaces where they do not get disturbed, such as under piano keyboards.... amongst all the felt washers. If the back cloth is ripped on a piano, its the perfect hotel restaurant entrance for insects. For up to 2 years, the maggot will wriggle & hunt for piano felt/ cloth and even eat the animal glue. Piano material parts then get all eaten, fall off and drop to bits. Throughout this process, just like any human being, they poo a lot.... and it usually resembles the same colour as the materials they have just eaten.... so if they eat green baize washers, their poo will be green - feeling rather gritty like poppy seeds. 4. After a full stomach, the larvae then prepare for adulthood - the cocoon. This forms a crusty shell around the maggot. 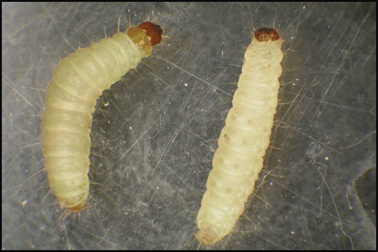 During this stage, the maggot will grow its wings, legs, thorax and become a fully fledged insect. (No damage). 5. 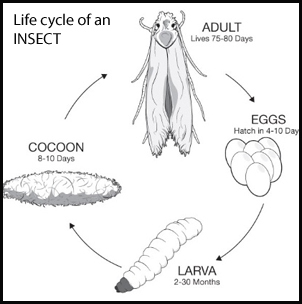 After around 10 days, the insect hatches from the cocoon. The initial growing process varies, but they usually stay in the piano until they breed again or die. When they fly, they tend to stay local - and continue eating piano materials, including their own cocoon. Any neighbouring insects in the local stream will soon find out about the piano, as signals are sent by the queen insect. Although we do not have evidence on an actual adult fly feeding, we have frequently seen them flying in and out of confined spaces in pianos.... so I suppose, why would they hang around? We HAVE though actual video evidence of the living maggot, eating and breathing inside piano parts.... not to be missed. 6. The life cycle then starts all over again. 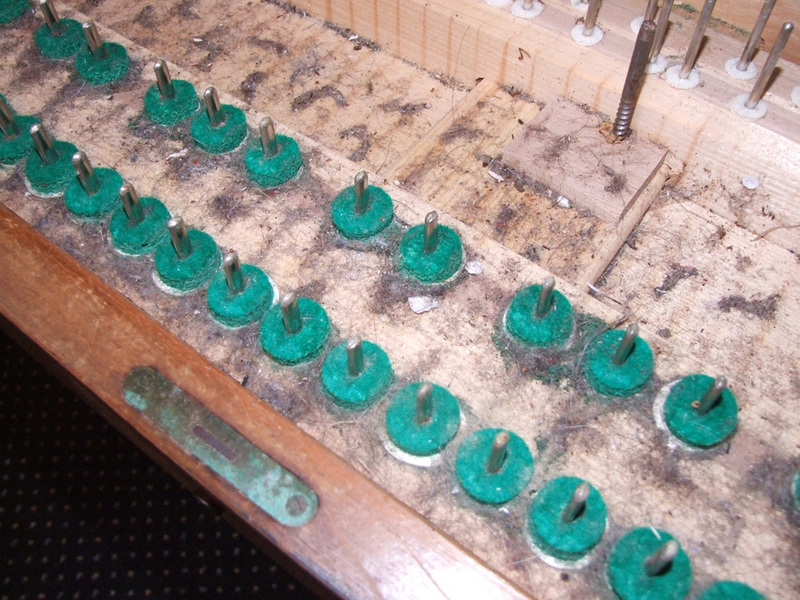 We treat any kind of piano insect damage VERY seriously indeed, and leave no stone unturned. 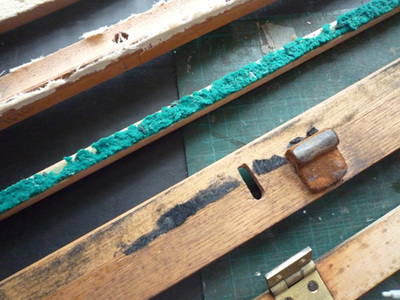 We have a special file in our piano repair section dedicated to insect damage issues (left). Once we open a new customer file (e.g. 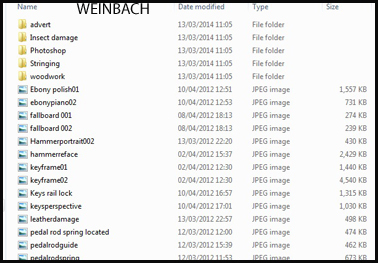 "Weinbach"), a second insect damage report is created, should the piano become infested. Image left: Clusters of red insect poo found around the red soft cushion felts (piano notes clicked when released). Many of the small cubed felts (5mm thickness) had been eaten; some had eaten the glue so they dropped off. Image centre: Key bed (piano keys removed) showing classic evidence of the cocoon and insect type living here. As some of the insects had been and gone, over decades the cocoons were clothed in thick dust (top of photo). Image right: The hundreds of dead carcusses of the may fly were found in various places, still in tact. It is estimated that these insects lived here for over two years. This insect is very small, light brown with silvery light wings. No live maggots were found. Looks nice eh? ...... think again. This piano was bought by a customer in all good faith. Smaller insects (like the may fly) tend to live off smaller and softer materials inside pianos.... perhaps they taste better ? This piano above suffered severe infestations of the brown house moth, about the size of a child's hand. The damage was so severe, most of the hard hammer felts had been dined on - an expensive repair. 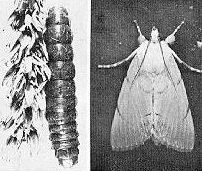 Image 1: Similar looking maggot & moth which carried out the crime. Top right of image 2: What to look out for when parts located - the full extent of the damage revealed in the workshop. 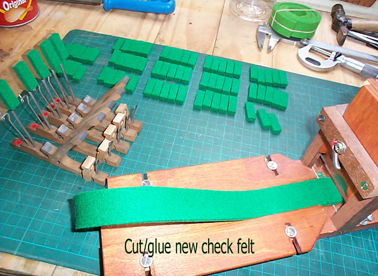 Image 3: Preparation/ guillotine cutting/ pre-gluing of new green check felts. If this felt is damaged or badly eaten, the hammers will not hold correctly when sustaining a note, they just aimlessly wobble backwards and forwards with no control. Image 4: Eavestaff hammer felts severely moth eaten. In most cases, the adult moth does the work here. Depending on location and how a grand piano is displayed, it is more common for grand pianos to get insect damage than upright pianos. Why? Some pianists like to show off the style of a grand piano by keeping the top lid open; even if played or not! This is a perfect airport and runway for anything flying by..... especially near woodlands and streams. Insects will thrive on easy access, and if the door is open, its free rent and meals for all guests. Once they get inside - they have squatters rights, and can breed in limbo there for several months before hatching eggs. The most common area for spotting grand piano insect damage is to look near the tuning pins. The strings ride over a capo bar as they pass under or over the cast iron frame, and this is often bushed with very thick soft cushion felt.... the perfect banquet. The string braiding material that twists under and over the strings near the hitch pins is also a classic location, as maggots and flies can neatly and snuggly tuck themselves away underneath, and even under the sound port holes. .
Of course, when the mechanism and keyboard is pulled out of the piano after 50 years of being untouched.... here lies another story. After 3-4 months of restoration, and thinking we had removed all traces, one flew into my face during stringing. The piano was later fumigated, sprayed and placed into quarantine before work continues. Fun eh? ! 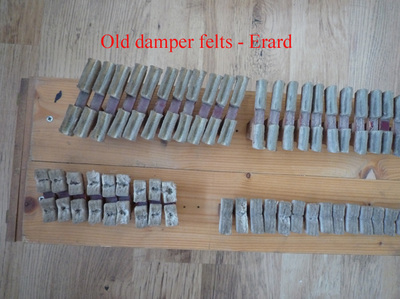 Image 4: Various Erard rest and guide rails awaiting restoration. Green felt eaten away, note this is the reverse for image 2. 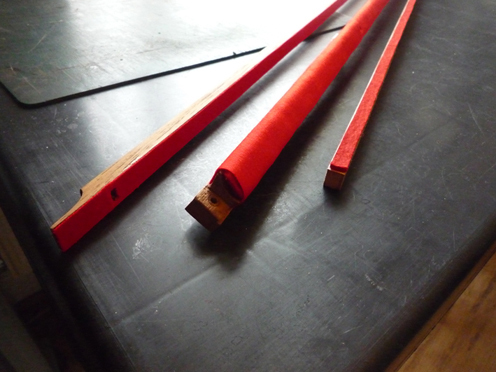 (Top rail): Hammer rest rail: Nothing left and completely eaten away - not even a tiny piece of felt left to measure up. Image 5: Rails from image 4 restored using "ravioli" style wrapping of material for pneumatic effect/ hammer bounce. Image 6: These are the fellas we found deep inside the damper felts, and even buried deep into the hammers. We did warn you.... but if you found this report interesting and would like to share your piano insect experience, do get in touch. The above piano images have not been edited or changed in any way - they are the real deal. Some of the insect images are very similar to what we have seen, and removed inside pianos - not a nice job. However, the following short video (sorry about the quality of the pic) has been taken just at the point we were working on some Erard grand piano hammers, and guess what crawled out? If you decide to buy a piano 'blind' and take it home without checking, then there is a risk of insect damage. If caught on early, if you detect any live or dead infestations, contact your piano tuner asap. There is not really any margin of error or barrier for the extent of damage that can be caused - any old signs of insect cocoons and dead flies may be found, but somewhere inside your piano, they could still be breeding during the colder months. Softer felts are easier and less expensive to replace. Depending on the piano name, if the hammers have been attacked by moths or their maggots, then the repairs can be very expensive. If you have bought an old piano at auction (say), who knows how many owners there have been/ where they have lived - your guess is as good as mine. 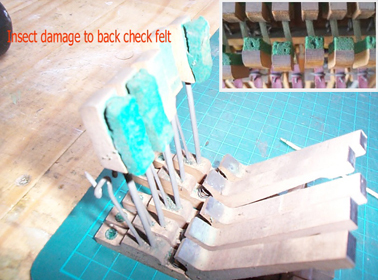 Depending on the manufacturer name and design of the mechanism, some piano restorers may not touch any piano with any signs of previous insect damage, and the repairs could be uneconomical. Before a piano is taken away for "insect damage repairs" -- it must first be quarantined and possibly half-treated to kill off any living creatures in your home. 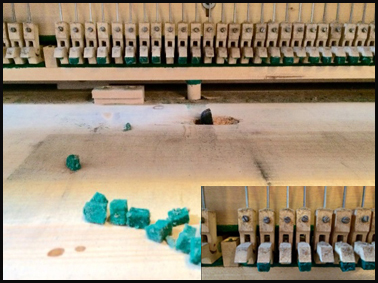 A piano restorer will not risk their workshop becoming infected, nor other pianos. If any insect damage is "manageable" by yourself .... buy some moth balls, place each one into a cup-shaped piece of tin foil (open at the top/ tin foil stops them rolling around).... then place a few under the piano keys, inside the key bed well area, and a few dotted around inside the bottom of the piano, and near the piano mechanism. If you see any living flies near the strings (not mechanism), lightly spray the area with a fine mist of fly spray. If you live near woodland, streams etc.... leave them inside your piano permanently, and replace them annually. If a piano cannot be tuned as a direct result of insect damage, you may be charged a standard call-out fee, and the tuner will walk away. If the piano is so old and neglected with insect damage (having no history or known ownership), we would recommend that you consider quietly chopping the piano up ready for 5th November. If this is the case, DO NOT attempt to sell or give away your piano for free.... this would be like passing on an infectious disease. Thank you for reading and understanding this report. Please PLEASE .... always have a piano checked over before buying, even if it is hundreds of miles away ! !